Do you need to lose belly fat? Are you looking for a muscle building diet? There is much misconception about the principles of building lean muscle mass and adhering to a muscle building diet. For some reason, guys think adding a salad to their daily meal, eating some chicken breasts...and pounding some magic supplements is going to make them look like Hercules in twelve weeks. It is all nonsense. That is not how your body works. In order to lose belly fat, you must establish a calorie deficit. You must burn more calories than you take in. And it needs to be done over an extended period of time...like 8-12 months, not 8-12 weeks. However, in order to build muscle mass, you must establish a calorie overload. You must burn less calories than you take in. Sat what??? No wonder guys turn to expensive and worthless supplements. When we talk about a "Men's diet" we are talking about a comprehensive program that includes eating to build muscle mass, regular and consistent workouts with weights, and cardio that centers on interval training. * The strategy that works best is to focus your initial and primary efforts on burning belly fat, building your strength, and becoming more healthy, lean, and muscular. * You will be training like an athlete. The conditioning world of an NFL player or a guy on the Olympic team revolves around eliminating fat, eating a bit more protein to build lean muscle tissue, and utilizing interval workouts to enhance both. * One other benefit of becoming more lean and muscular is that this is the exact type of build women admire in men. In reality, they do not care for the bulky, steroid-bloated look of professional bodybuilder competitors. 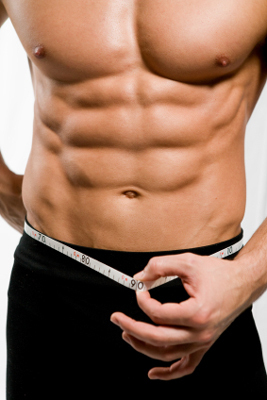 Burn The Fat - Feed The Muscle is the best program we have found for male fat loss. * Tom's program is designed for you to become much more educated about how your body works to build lean muscle mass and belly fat. * You will also learn what situations and behaviors sabotage your fat loss goals and muscle gains. * You will be expected to begin a more positive lifestyle when it comes to food choices. Crap like donuts, double-cheeseburgers, and a bucket of wings with the guys will no longer be part of your every week diet. * You will be expected train intensely (not insanely) in the weight room and focus on lifts that will help you gain muscle mass while elevating your metabolism to burn belly fat. * There will be no more mindless cardio (like riding a stationary bike while reading a book.) You will now integrate interval training into your workouts and begin to condition like an athlete. * The great thing about Burn The Fat - Feed The Muscle is that it is a proven men's diet program that has helped 1000's of guys who needed to lose belly fat and get rid of love handles. Tom Venuto is a straight-shooter. He does NOT require you to purchase expensive supplements, fruity shakes, or lame exercise equipment. All he requires is a commitment to yourself.